Solana Beach is one of the seven delightful coastal communities, which comprise north county’s enchanting coastal zone. 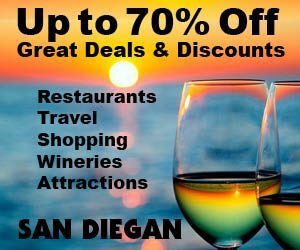 It’s located between Del Mar to the south and Cardiff by-the-Sea to the north and is 30 minutes north of downtown San Diego. And as you might guess this coastal city has a charm all its own. For starters it’s home to a wide sandy 1.7 mile beach, which is easily accessible from the Fletcher Cove Park (see map) and is located at the foot of Lomas Santa Fe Drive. Plus, it’s home to dozens of outstanding restaurants, well-known shopping centers, a highly acclaimed award winning live theatre troupe, two challenging golf courses, beautiful homes, a train station and one of the most popular live music venues on the west coast of the United States. Being accessible by train is a real perk and a fun way to visit Solana Beach as both the Amtrak and the Coaster stop here. Thus, many North County residents park here and take the train to and from work. Easy accessability is also afforded via historic Old Highway 101 and via the popular I-5 freeway. So no matter how you get here you’ll be delighted with your discovery of this coastal community, which is an incorporated city with a long history that dates back to the 1920s. An eye-catching attribute to the city’s beauty is its drought tolerant Mexican Feather Grass that sways in the wind along the Old Highway 101. From the I-5 freeway, the most popular access is via Lomas Santa Fe Drive, which travels in an east west direction and ends at the city’s popular sandy beach to the west and at its two golf courses to the east. En route, this thoroughfare crosses many landmark thoroughfares including Old Highway 101, which is home to fine restaurants and the city’s local nightlife. Not to be overlooked is Cedros Avenue (14), which is home to the world famous Belly Up Tavern (15), which is the West Coast’s most popular music venue featuring touring bands, with a different band playing here almost every night. Even the Rolling Stones have played here. The Belly Up Tavern (circa 1974) also has a popular restaurant aptly named the Wild Note Cafe. Here too along Cedros Avenue are 85 shops, other restaurants and a Farmer’s Market (12) offering its fresh produce each Sunday beginning at noon. The enchanting Cedros shopping district is a “must see” destination crammed with popular one-of-a-kind boutiques including Cassidy’s Interiors (11) at 312 South Cedros Ave. (858-755-2728), an eclectic furniture boutique, A-16 a clothing boutique. So find a parking place and stroll the dozens of fascinating clothing stores, gift shops, galleries and furniture stores including an antique store or two as well as places for a bite to eat. You won’t find a more fascinating shopping district anywhere. Across Lomas Santa Fe on Cedros Avenue is the Amtrak and Coaster station (13) frequented by locals who choose to commute to and from work via the train. Here too, is the Solana Beach Visitor Center (13) at 103 North Cedros Ave. It is open daily from 9 a.m. to 5 p.m. and is closed on all Federal and State Holidays. And across the street from the station is a well known destination, one of the best tasting hamburger joints within miles. It’s called Chief’s Burgers and Brew (10), at 124 Lomas Santa Fe (858-755-2599), and as you might guess it is a local favorite. 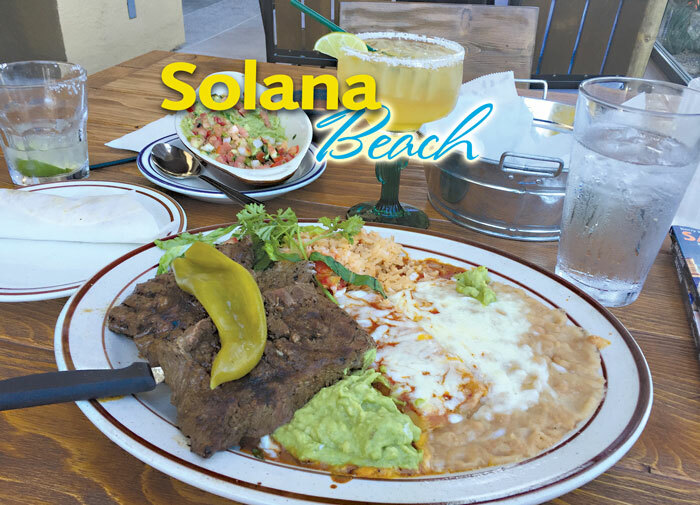 Where to eat is never a problem as Solana Beach has several restaurant rows with one of the most popular being along Old Highway 101. If there is one restaurant and microbrewery that has done more to create the buzz for San Diego being the Micro Brewery Capital of the World it’s gotta be the original location of Pizza Port (17). Its popularity has spawned locations up and down the coast from San Clemente in Orange County and south to the one and only Ocean Beach, which is home to the longest cement pier on the West Coast of the United States. And all of the locations have the now popular trademark of seating indoors on wooden picnic tables. Back in the day when they first opened all they could afford were picnic tables. Now they’d create an uproar if patrons couldn’t sit at a picnic table. The house specialty is freshly baked, out of the oven pizzas and one of their many thirst quenching Pizza Port micro brews. Don’t miss becoming part of the legend by saying you dined here. Travel a few more doors to the north and you’ll find yourself at the Tidewater Tavern, which is one of the friendliest bars in town. A few doors farther north is one of the best breakfast spots in town. This spot is a local legend as well for breakfast and lunch called T’s Cafe Restaurant and Bar (16) at 271 North Highway 101. It’s open from 7 a.m. to 2 p.m. daily. At the foot of Lomas Santa Fe Drive is the Pacific Ocean and the beach (24). Travel south along Old Highway 101 to 437 South Highway 101 and you’ll find yourself at the Beachwalk Center (19) which is the new home of the world famous Alfonso’s of La Jolla (19), (858-454-2232) [alfonsola- jollasd.com] at 437 South Highway 101. Locals claim that they serve the best tasting Mexican food north of the border. Aficionados of Mexican food will tell you that their carne asada served with refried beans and Mexican rice is the best they have ever tasted. Add a frosty margarita and you’ll think that you died and went to heaven. See restaurants. This plaza is populated with a half dozen other restaurant legends as well including a location of a forever popular California Pizza Kitchen (858- 793-0999). For seafood inspired tacos and burritos, grab a bite to eat at Rubio’s (858-259-9611). And locals never tire of enjoying Crush Italian Restaurant (858-481-2787). Here too is Choice Superfood Bar and Juicery (858-704-4346). And as fate would have it, you can also enjoy a growler to go or a micro brew of your choice at San Diego BeerWorks (858-353- 7174). You definitely won’t be disappointed with this dining destination. Further down the road is a Thai Restaurant called Bangkok Bay (21) at 731 South Highway 101. It’s a local favorite. If you are looking for a place to stay, then you’re looking for San Pebbles Resort (20), Holiday Express and Suites (20) and Courtyard by Marriott (20), which are virtually in a row along the Highway and are right next door to the Solana Beach City Hall. 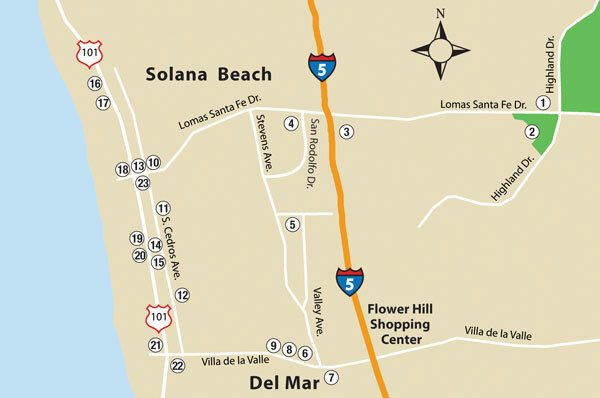 The southern boundary of Solana Beach (see map) is a main thoroughfare you’ll soon come to called Via de la Valle. Interestingly enough, the north side of the road is Solana Beach and the right side is home to the Del Mar Racetrack (7). Across from the track, on the corner of Via de la Valle and Jimmy Durante Boulevard, is where you’ll find The Fish Market Restaurant (6) (858-755-2277). There isn’t a finer seafood restaurant in North County. Here along this thoroughfare you’ll find a total of three world class restaurants. First is the award winning Fish Market Restaurant (6), located at 640 Via de la Valle (858-755-2277). They serve the finest seafood you will ever find. As their name implies, they also have a fresh fish market in addition to their nice, casual restaurant. Featured on the menu are more than 100 menu selections. The restaurant also has an oyster bar, cocktail lounge and retail market. Drop by the retail market to take home and cook fresh seafood yourself. They also have a second location in downtown San Diego at the Embarcadero, overlooking romantic San Diego Bay. See Restaurants. A few doors away is the Del Mar Racetrack crowd’s top pick for the best tasting prime rib in the world. It’s called Red Tracton’s (8) at 550 Via de la Valle (858-755-6600). They also have an extremely popular piano bar where diners have been know to dance to the music of their incredibly talented piano player. Valet parking only. As if these two outstanding restaurants aren’t enough, you’ll be hard pressed not to proclaim that the Pamplemousse Grille features the best tasting con-temporary nouvelle cuisine in the world. The Pamplemousse Grill (9) is located at 514 Via de la Valle (858-792-9090). 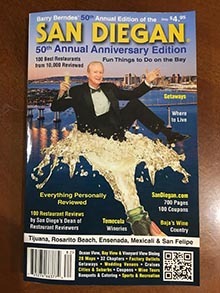 Savvy diners who know Solana Beach like the back of their hand will tell you that you must take a left at the signal (see map) where Jimmy Durante, Valley Avenue and Via de la Valle meet and head north a few blocks to discover one of San Diego’s best kept secrets. It’s Solana Beach’s Mexican Barrio aptly called Edens Gardens (5). Since the 1940s Mexican food lovers have been flocking to the legendary Tony’s Jacal (5) for what they say is Mexican Food at its finest. Housed in a stunning adobe inspired building, great tasting Mexican cuisine is served. Tony’s Jacal is located at 621 Valley Ave. (858-755-2274). Around the corner is yet another local favorite called Fidel’s Little Mexico (5) at 607 Valley Ave. (858-755-5292) with its own following of devoted diners that claim this restaurant has it all–great Mexican food and a perfect atmosphere and cantina to match. This tiny enclave of outstanding Mexican restaurants is called La Colonia de Eden Gardens (5), and you’ll undoubtedly agree that it’s heavenly. It’s located five tenths of a mile north of Via de la Valle. See the map to find your way back to Lomas Santa Fe, where you’ll discover more restaurants and two shopping centers (4). The largest of which is east of the I-5 freeway and is home to the North Coast Repertory Theatre (3) at 987 Lomas Santa Fe Dr., suite D (for tickets the box office number is 858-481-1055) [northcoastrep.org]. The theater is a professional Equity theater celebrating its 36th season. It has received critical acclaim from media and audiences alike and has evolved into one of the area’s leading performing arts theaters. It’s in the Lomas Santa Fe Plaza. Patrons never tire of attending their outstanding award winning plays. Get Theatre Coupons for $5 off any Main Stage Show. Also in this plaza (3) is a Von’s, Home Goods, Big 5 Sporting Goods Store, Pizza Nova, Baskin Robbins, Leo Hamel Fine Jewelers and more. Just east of the shopping center is where you’ll find one of the most challenging and enjoyable golf courses in San Diego County. It’s the Lomas Santa Fe Executive Golf Course at 1580 Sun Valley Rd. (1). For reservations call (858-755-0195). This 18-hole par 56 public course was built in 1974. Across the Street at the corner of Highlands Drive and Lomas Santa Fe Drive is the Lomas Santa Fe Country Club (2). They feature golf and tennis. Solana Beach Chamber of Commerce (18) at 210 West Plaza St. or via Post Office Box 623 Solana Beach, CA 92075 [solanabeachchamber.com](858-755-4775). The 38th Anniversary Celebration of Fiesta del Sol will be on May 21st and 22nd of 2017. The Solana Beach Chamber of Commerce has been hosting this free 2-day Music & Crafts Event for 38 years as a kick off to Summer in Solana Beach! This one-of-a-kind event includes the efforts of the Belly Up Tavern, pro- viding a list of musicians to perform over the two day event; which also includes local community talent. They also offer a large, fun, and exciting Children’s Area set up for families to enjoy rides, games, and a climbing wall. Plus, the Cedros Design District offers a celebration with bands and shopping specials during the weekend. The parking options include a shut- tle. Fiesta del Sol has something for everyone. Food Trucks along with other great specialty food vendors are featured as well as an Arts & Crafts area. Plus, the Solana Beach Fireman’s Pancake Breakfast will be on Sunday, and much more! There will also be a host, an exclusive area for local artists and local food vendors. There will aso be a beer and wine garden, which is also a big hit. Yes, Solana Beach has a lot to offer.